Systemnt makes valid points. There's no argument Kim is evil and Trump would be wise to tread very carefully. Could be a head-fake, could be a new reality. However, there's only one person on planet earth who has both the power to start ww3 (or is it ww4 now?) on the Korean peninsula or unite and lead one of the two Koreas towards peace. The calculus is how do you get this to happen without having a single shot fired, avoid civil unrest, and a humanitarian disaster? Many possible outcomes, good and bad. Kim may have seen the light with Saddam, khaddafi, and Assad and figured being a dictator has a predicable outcome. Also keep in mind that if trade is opened up, the Korean people will be awash with things they could never of dreamed of. You really think Kim is going to just open up his people to the world so they'll realize he's just a tin pot dictator they should overthrow? He ain't stupid, and he'll make sure they keep believing the outside world is a hell hole and that he's their savior. Only he and a select few will benefit from any economic stimulus or trade agreement. Only he and a select few will benefit from any economic stimulus or trade agreement. I agree with everything you state but this part. He has been running the country as basically a labor camp for decades, it really cant get much worse for most of the people there. Kim has a motive for sure, and I dont know what it is. If i had to guess, I dont think his nuke program is what he said it was. But yes, I agree that he will be putting himself first, whether it is trying to not get killed by his own people or face prosecution for his criminal actions on a world stage. Help me understand how he can open up the country to trade, but still keep his people believing that the rest of the world is evil? it really cant get much worse for most of the people there. Kim controls the means of production, the government, the military, doesn't allow internet access to the outside (see Kwangmyong), the only allowable media is state propaganda, and tourists are tightly controlled. So the real question becomes: how are you going to ever convince North Koreans that the rest of the world isn't evil when that's all they'll ever hear? Lifting sanctions doesn't mean NK will give its people access to global internet, the ability to meet foreigners, the ability to leave the country, or the ability to read/watch anything but state propaganda. Hey, maybe Kim is planning to give up his nukes, turn NK into a democracy, and step down from being a God. But I just can't see it. Thanks for the link, I was honestly not aware of how awful the conditions in NK have been. Seems like there is a lot of room for improvement though, right? Seems like that if NK does not engage in some sort of trade, its people are going to starve to death, again. Call me crazy, but I am cautiously optimistic here. Optimism is good, but NKs history of dealings makes me very skeptical. For sure, Trump should receive his due credit for the latest prisoner release, and I’d consider this whole ordeal a win if nothing further happens. If they go further, I hope Trump does come to legitimate agreement that disarms North Korea, ends the war, and they honor it for more than a few years. I’m just skeptical that Kim Jong Un is selfless enough to do so, especially given his brutal history. I guess only time will tell. It doesn’t help that China does not want us becoming friends with NK, because that country is a buffer for them from a significant American military presence. And unfortunately they exert incredible economic influence over NK, such that if they cut off trade with NK, the whole country would starve. If you get a chance, read “A River in Darkness”, by a North Korean who escaped during the famine (Masaji Ishikawa) it’s mind blowing what goes on there. I’m just skeptical that Kim Jong Un is selfless enough to do so, especially given his brutal history. I out kicked my coverage some time ago on NK. But I understand that Un, has been in power since around 2011-12. And that while he has been brutal, in the perspective of NK, he hasnt been as bad as the other dictators before him. I agree on China. But the US also owes them a little of a Trillion dollars at the moment. And I understand that if you are going to go into debt with a lender, it is often better to owe them a colossal amount of money versus a little bit of money. Seeing that the lender is going to do what it can to get its colossal loan back. For sure, Trump should receive his due credit for the latest prisoner release, and I’d consider this whole ordeal a win if nothing further happens. This really doesnt move the needle much for me. But it did remind me of the UVA kid Otto, that was sent back in a coma, then died. Trump made a pretty big deal about him, even invited his parents to his SOTU, and they attended the Olympics. I’d say yes that’s true, but only becauss the first few dictators in a communist country are always the most brutal because they have to literally break their people, so that they can re-shape them in their desired image. Once a few brainwashed and broken generations have come and gone, it gets easier to control people. Regardless, he still fully utilizies their concentration camps, executes people with anti-aircraft guns, and very early on purged any family/friends/government officials that he didn’t like. Hell, he had his own brother assassinated. Little Kim doing a little flexing and trying to save face before meeting....as expected. More to come i'm sure. And a few S Koreans. Yes it is great news they are coming home. CNN: Trump kidnaps 3 Koreans ahead of talks with Kim Jon Un. Just shared that with a coworker and he actually thought they had stooped that low haha. "Senate Minority Leader Chuck Schumer, D-N.Y., on Wednesday warned the Trump administration against going easy on North Korea in talks about its nuclear program just because that country released three U.S. detainees. "We cannot forget: No regime has the right to hold American citizens in captivity without cause, and under no circumstances should American citizens be viewed as bargaining chips," Schumer said Wednesday on the Senate floor. Last edited by Pedernal; 05-10-2018 at 10:24 AM. Schumer is technically correct about hostages as bargaining chips, but they were released BEFORE the negotiations as a sign of good faith with no strings attached, so his whole point is moot...needs something to complain about I guess. date set,June 12 in Singapore. Last edited by Man; 05-10-2018 at 11:24 AM. Unfortunately it'll take years from now to tell whether any agreement made is worth the paper it's written on. I hope it does as it would end the last vestige of the cold war, but have little faith in NK. Oh I fully agree. More so was just poking Systmnt but he didn't take the bait. Trump is walking into this meeting with a royal flush and lil kim has a pair of deuces. Im pretty sure trump will put him all in or fold. Either way, trump ends up with the chips. What exactly do you think Trump is holding over the lil dictator? Having a great poker hand doesnt work when the game is hangman. little rocket mans is literally at the nod of his head..and doesnt have to point at us..or give a **** about what anyone else thinks. True. If little rocket man fired shots at US soils, I'm pretty confident Trump would get approval to respond in kind. I'm also confident Trumps approval rating would sky rocket (no pun intended) as the large majority of voters would approve. I hope and Pray it never comes to that level of force. Here is what i "Think". Lil rocket man buried a hydrogen bomb under a mountain and was going to make a big show of blowing it off on a big holiday last year. It did not detonate due to a computer hack by someone. A couple days later Trump said he had a nuclear button that actually "Works" Hint , hint, hint. you think they were a little nervous digging that bomb out from under thousands off tons of concrete? A few months later lil kim fired up his new centrifuges at his state off the art site. Boom goes the lab just like Iraans lab went boom. probably killed most of his scientists and the site is unusable. The little fellow made his first trip out of his country and went to China to find out what was up. That was a huge move for him. he met with Xii who told him that he actually was not a god and trump was about to squash him like a bug and there was nothing they could do about that. Im thinking Xii actually explained how his dueces stacked up against the royal flush that China KNOWS trump has. Time to fold rather than put all his chips in the pot. 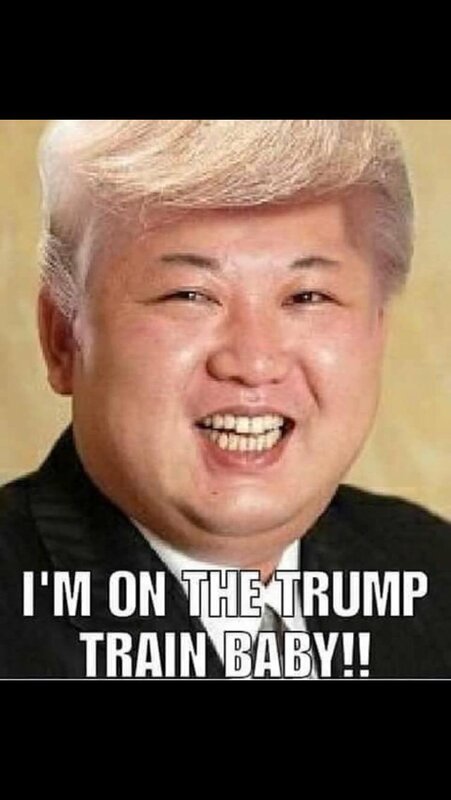 Maybe he can out last trump and try again undder the next admin..
China is not NK daddy... if it were..there wouldnt be a need to intervene with trump. China isnt afraid of trump. Hacking NK , much less a military installation is something out of a movie and not realistic given their complete control of blacking out, control of any communications in or out, and the sanctions in place. Kim is a God..he was raised as a God he is reveled as a god and a outsider telling him he isnt one is meaningless. Nk's history doesnt support anything youve stated. We rarely disagree on anything but we do this time. China is certainly afraid of trump. they believe he is crazy enough to wipe the ground in NK and they wont risk that. China is NK daddy. thats why he went there to try and figure out what was actually going on You realize he NEVER traveled out of NK before. As far as hacking a military installation being something out of a movie, tell that to those dead Russian and iranians when their site spun out of control. You realize he NEVER traveled out of NK before. That's not hacking, that was a worm specifically targeting Siemens PLCs which the US knew they were using. That worm was introduced via the internet, then spread through USBs and shared printers. There's one major problem with creating a worm to screw up a nuke: nukes don't need software to go boom, just a detonator, making a worm useless. Also, no one died from the stuxnet worm, it just damaged a bunch of centrifuges. Last edited by sir shovelhands; 05-11-2018 at 05:42 PM. I think Carguy got most of it right. Kims "hand" was based off of him having a nuke. What if he doesnt have a nuke, or know how to use it or be able to get it out of Asia? The entire country basically lives in the stone age, starving to death, but they want to play around with nukes. Forgive me if I think something may go wrong when they use that level of technology. Kim has used this threat to basically get paid off before. I dont see it working this time. The problem with being told you are a God. Is that at some point you have to prove it. Just killing off people that dont buy into your theory, wont work forever. Trump has experience negotiating with all kinds of people, businessmen, politicians, P stars ( ); Kim has very little experience dealing with anybody, not using force. And he isn't exactly turning water into wine over there. I mean, I guess I think that Kims know he isnt a God. Can you imagine what a hollow feeling it must be to be told that you are a God on a daily basis, but you have to put your pant suit on one leg at a time, and your poop smells just as bad as the next guy. Pretty sure that China doesn't treat him like a God either. Only part that lives in stone age is the parts not in power and that stone age is due to a complete and utter lock down of the country for over 3 generations. At least 3 generations of dear leader and supreme leader disagree with your assessment of 'proving it'. When you control the information, you control the education of the population..when you control the populations education, you control the length of your dynasty. The fear isn't from NK nuking the continental US.. its from it attacking surrounding countries - much of are at odd's with bigger china.. but when you are thought of as being a God.. you dont have a daddy country..regardless of what the western world thinks. China will be as passive as they need to be..they could give two ****s about NK. Negotiations only work when both sides are actually negotiating. Posturing isnt negotiating.. and believing NK is doing anything other than posturing , for a variety of reasons - stalling, hiding more ****, at the request of others (ie russia), or as a military tactic , isn't paying attention to history or being realistic in any form or fashion. "The official Korean Central New Agency said it would take place between May 23 and 25 and involve collapsing all the site’s tunnels with explosions, blocking its entrances, and removing all observation facilities, research buildings and security posts." I dont disagree. I get that Kim has brainwashed his people, through generations of iron fisted control into thinking he is a God. My point is that Kim knows he isnt a God on some level. I mean a God, wouldnt have to rule in the fashion that you describe. If you were a God, there wouldnt be a reason to control info, or the education of your people, or kill off your family. That has got to be a pretty empty feeling. Knowing that you are not a God, the world knowing that you arent a God. But hey you have a couple beaten down folks, living in mud huts, eating a few grains of rice a day, those folks think you hung the moon (because you will kill 3 generations if they dont). Gods dont need to posture. Kim was raised from birth believing he was a God. And taught what God meant, How a God is expected rule and What a God does to maintain order. He knows or cares to know, nothing else. The population he rules, have believed this family is God..they too were born into it, taught it, and know NOTHING else. "The official Korean Central New Agency said it would take place between May 23 and 25 and involve collapsing all the site’s tunnels with explosions, blocking its entrances, and removing all observation facilities, research buildings and security posts. It also will open all borders, and begin construction of the North Korea Disney World, and begin holding auditions for the next Supreme Leader on a televised show called 'North Korean Idol' "
You are applying your version of a God to NK version. Its a flawed comparison. If rocket man still believes he is a god, why is he meeting with our sec state?? Well i can agree that he hasnt suddenly had a change of heart. Maybe he thinks he can stall a while and out last trump. either way, i think Trump is doing exactly the right thing here.